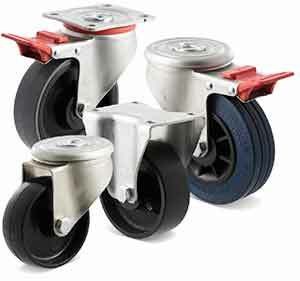 Wide range of castors, from light duty to heavy duty industrial castors. Made in Australia by Fallshaw. Can be supplied to suit the grip neck pintles. Wheels with plain bushes have 12mm bore reduced to 8mm by axle bush. Shorter square pedal and colour options available. Fitted standard with ISO mount plate eg. MSA100G/MZPTB. Normally placed around the edges of the trolley (between corner buffers) to prevent damage to door jambs, etc. Fitted by pushing an (off-cut) metal strip along the centre of the section and screwing through into the side of the trolley. 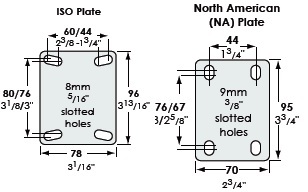 The head of the screw will pop through the outer rubber leaving a small hole. If the strip is to be fitted on a rounded corner, this should be of at least 50mm radius to prevent buckling of the strip. 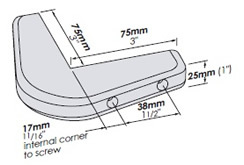 Corner buffers can be fitted to new or existing trolleys with square corners. They stop much of the damage to walls, door jambs, etc. They are fitted by four pan head self tappers, which are recessed down inside each arm of the buffer (No. 10x1” or similar). Being made from TPE they are very resistant to abrasion, chemicals, etc. 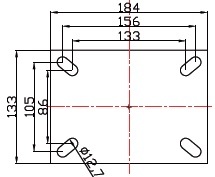 The end profile is matched to the ‘D’ section rubber strip. These are used to prevent damage to corridor walls. The buffers are placed onto tubular legs just before the castors. When a trolley approaches a wall the buffers make contact first and freely revolves on the tubing, thus rolling the trolley along the wall so it causes no damage. In the case of 25.4mm (1”) square tubing the urethane buffers are supplied with a 38mm (11/2”) hole, together with a ‘dress-cap’ with a 25.4mm (1”) square inner and a 38mm (11/2”) round outer. Fitted standard with ISO mount plate eg. MTQ150G/MZPTB. Commercial refrigerated display units and vending machines should be regularly moved out from the wall so you can clean behind them. Increasingly, public health regulations require this. A choice of plate mounted or screwed stem (3/4" BSW) allows ease of fitting to these cabinets. 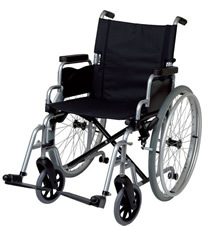 The back castors can be plain swivel whilst the front castors are swivel fitted with simple thumb screw brakes or pedal operated total brakes. 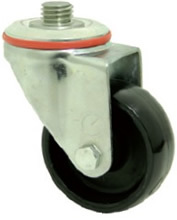 While developed for refrigerators and vending machines, these castors can be used elsewhere. 5 year warranty on fork. 3 year warranty on wheel. CoreCoatTM lacquer provides 3 times the Australian Standard for corrosion protection. All wheels have a 20mm bore reduced to 1/2” with axle bush. Suitable for use with solid pintles. The wheel only code includes the axle spacer kit necessary to fit into forks – for example YTDMD350 includes T350X4DMD-SB20 plus the spacer kit of two top hat side spacers and one internal spacer. 100mm (4") size are recommended up to 120Kg trolley loads but only on smooth floors and for short distances, thus they can be used on ward furniture, but not on catering equipment. 75mm (3") are even more restricted, being recommended only up to 100kg trolley loads and again only on smooth floors without obstructions for short distances. 50mm (2") are recommended only up to 80Kg trolley loads and for very short distances. If used on carpets a maximum load of 50Kg is appropriate. The research is absolutely clear - large diametre wheels reduce forces for all trolley movements. TO DO ITS JOB PROPERLY, A CASTOR MUST SWIVEL AND ROLL EASILY. IT CAN ONLY DO THIS WHEN THE TROLLEY AND THE CASTOR ARE THE RIGHT SIZE … AND THE CASTOR IS PROPERLY FITTED. When the goods are to be moved in a relatively limited area, either during manufacture, or to and from storage, mobile trolleys are the easiest way. Most industrial codes restrict the direct lift of an adult to 13-18Kg. Using wheels and castors allows this same person to move 600-1800Kg, but greater loads require mechanical assistance. Roughly, using modern castors such as ours, a fit adult can push 600Kg continuously, or 1200Kg for 10 metres or 1800Kg for 1 metre given appropriate tyres and floors. If greater loads are to be moved there is a clear case for towing the trolley with a tractor of some sort. The responsibility for the design of the trolley must ultimately rest with our customers. Good castors can make a well designed trolley work even better, but they cannot do much to improve a wrongly designed trolley. In general the most comfortable shape for a trolley is one where the sides are about 11/2 to 2 times the width, and not too high. They have to go through doorways. Hand pushed trolleys have to be at least 80mm narrower than the narrowest doorway and that is across the buffers (corner, leg or strip) which should be fitted). Towed trolleys need to be at least 500mm narrower than the narrowest aisle or doorway, and more if towed in a train. Otherwise it will not track smoothly around corners. If it must be long you may need to experiment to find the best castor arrangement to suit your particular needs. Most trolleys are restricted in width to suit the aisles, and will topple over if too high. High trolleys you cannot see over are a safety hazard. As a rough guide the weight of the trolley is usually 15% to 20% of the load it is to carry. For the castor to function properly the frame of the trolley must be strong enough to hold the castor head truly vertical so it can rotate freely (that is the mounting plate must remain horizontal), and the frame must not bend under the impacts that invariably occur. 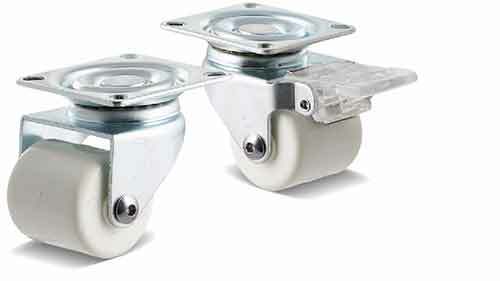 The most common cause of castors not tracking properly is that the mounting has twisted off square. It is often safer, and more efficient, to divide a heavy load over a number of trolleys rather than concentrating it into one. Trolleys which are too heavy to move conveniently remain unused, or people suffer back injuries. 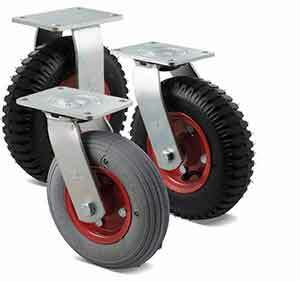 Castors will not roll easily if they are not big enough for the load and floor conditions, Castors 75mm (3") should only be used on light weight, seldom used equipment. Even diameters of 100mm (4") are only useful on smooth floors. Any trolley wheeled quickly, or on uneven floors, needs 125mm (5") or larger. The heavier the load, the larger the wheel. Hard treads roll most easily on smooth floors, but may damage them, and are also hard to roll over obstructions. Most people can exert 17kg of push to get a trolley rolling, and about 12kg to keep it moving. This reduces to 6kg over long distances. This is the reason that ball bearings are more popular than plain bearings, as they allow more load for the same push effort. 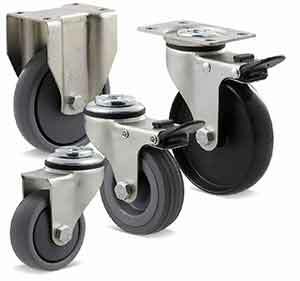 Castors will not swivel properly unless they are mounted vertically. Otherwise they will track to one side. Heavy industrial trolleys need plate mountings, but the base of the trolley must be strong enough to withstand strains. Never mount a plate castor by 3 bolts only. Never skimp on the mounting base. Remember - if the castor does not stay mounted squarely, it will not swivel freely. 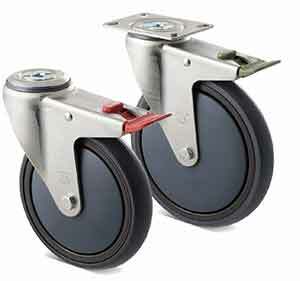 Medium duty castors are often mounted into tubular legs, but again it is important that these legs stay vertical. We recommend that the leg never extend more than 125mm (5") below the nearest support, and (apart from the lightest uses), the tube should be 1.4mm (1.7G) thick or more. Thinner gauges often split. If you wish to use lighter gauge in the rest of the trolley, insert a sleeve for at least 150mm (6") where the castor is mounted. Never put a round expanding fitting into a square tube. The first time a trolley hits a bump, the tube will elongate, and the castor will fall out. We do have square fittings, and ask that you do use them. If for some reason you need to put round into square, then weld an insert sleeve of round tube (remember - our smallest fitting needs 3/4"ID). 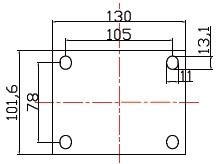 When using Directional Lock (DL type castors) it is best to use the solid swivel stem (A type) and weld or bolt it in - screwed types can become misaligned. 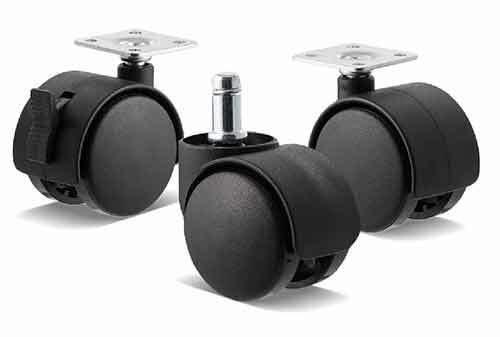 To achieve the best performance from the larger 175mm and 200mm castors, use solid stems. 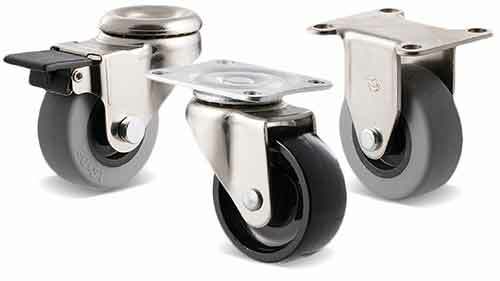 If rigid and swivel castors are to used together, have the rigid castors at the front, making it easier for it to turn. Why? High resilience materials return energy after compression just like a running shoe (think super balls vs. squash balls - same hardness, different bounciness). Domed tyres require less force to swivel a wheel (and are generally used in our light to medium duty castor ranges) - note that most Fallshaw light to medium duty castor ranges brake on the sides of the wheels and rely on our domed profiles. Flat profiles spread load and prevent damage to floors at high load ratings (and are used in our heavy and very heavy industrial duty ranges). 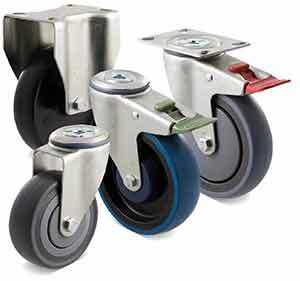 wheel selection - refer to the ‘specialized castors’ pages and to our website for more information.